One of the best-selling children's books of all time. First released in book form in 1946, this story has since appeared in numerous editions. 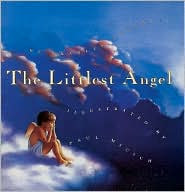 It tells of a small angel who simply can't get with the program no matter how hard he tries. Then an understanding elder angel realizes that he's homesick and is able to retrieve a box of his most treasured possessions from "back home." When it comes time for Jesus to be born on Earth, The Littlest Angel gives his precious box to the Baby, but he is worried that God will think his gift too humble. However, God is pleased indeed, and transforms the box into The Star of Bethlehem.